The soil in the hoop houses at Johnny’s Selected Seeds should be stone-hard in mid-December. But inside, rows of winter chicory unfold glossy leaves of mottled green and maroon. The door stands open to the sullen, gray sky. “Look, this one has a lot of frost damage,” Dr. John Navazio observes cheerfully. “Look at all the ladybugs on that one. It must have aphids or something. Ideally, 80-85 percent of these will die. ”By pitting these radicchio plants against the cold, renowned plant breeder Navazio hopes to unmask a few variations that can take winter on the chin. He’ll let the survivors go to seed, then send that seed through another winter for an additional round of selection. By the same ancient process that produced such varietal extremes as black tulips and Labradoodles, winter chicory will become Maine-winter chicory. With Mainers craving a locally grown menu that stretches from soup to nuts and includes a tasting flight of beer, the need for Maine-worthy plant varieties is sending seed breeders back to the well of diversity. 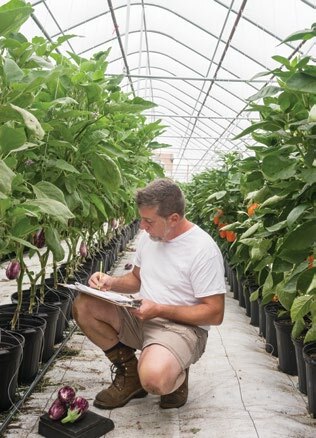 They need to come up with seeds that thrive in a climate that’s in the throes of climate change, and still more seeds suited to the hydroponic and hoop house systems their customers are investing in. Hence Navazio’s experiment: he bought a packet of radicchio seeds from Italy, where consolidation has made less headway. At Johnny’s research farm in Albion, he gave them room to express themselves. The plants are remarkably varied, with some forming firm heads, some flat as dinner plates, some frost-browned and dispirited. Only time will tell if one holds the genetic key to Maine—four to seven years’ time, at least. But the result? In experiments large and small across the state, farmers and plant breeders are now tinkering in earnest in a quest for appropriate seed. 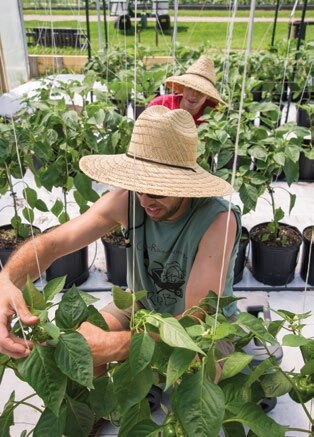 In a greenhouse next to Navazio’s, Emily Rose Haga is pushing the limits of tomatoes and peppers. As farmers yearn for more hardy and disease-resistant vegetables, Haga is producing a crop of crossbred seed to field-test next spring. “There’s a huge, and a growing, demand for new varieties,” Haga says. 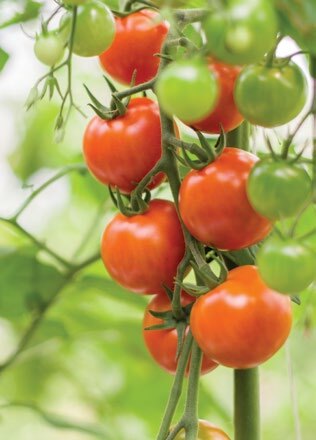 “Our customers are experimenting out ahead of us.” Haga crossbreeds plant varieties in hopes of combining their traits in the next perfect tomato: the disease-resistance of this parent, the flavor of that parent, and perhaps color variation from another contributor. The time and expense of this work is considerable. In 2015 Haga was shepherding six new tomato types through real-world testing to reveal one new seed offering. And 37 pepper varieties, plus nine lettuces. All told, Johnny’s had dozens of species in some stage of development in 2015. The slow pace of vegetable life contributes to the expense. 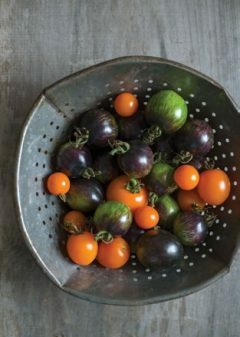 Vegetables are decidedly seasonal beings; loathe to sprout a new generation before their seeds are stimulated by the customary day length and temperature. Only rarely is it possible to shorten an experiment by assessing immature plants, says Haga. She did recently breed a new tomato whose resistance to disease was linked to a distinct “marker gene” in its DNA. In such a case, she can send seedling samples out for genetic testing to see which contain the coveted gene. But for the most part, nature dictates the speed of this science. One enthusiastic source of assistance is the community of Maine farmers. When Haga has nursed a few generations of a new variety in the greenhouse, she sends the next generation out for trialling. Local farmers voluntarily take about 20 of the plants to see how they fare in the real world, and in real farmers markets. Another source of support is farmers outside of Maine. Although Johnny’s was founded in 1973 to locate and distribute seeds to cold-challenged New England farmers, the company quickly became known across the northern latitudes for high-quality seed. So paradoxically, in this “buy local” era, Johnny’s is expanding its trialling network to a number of far-flung farmers who are just as eager as Maine farmers to serve their own “eat local” customers. And this network now extends into the South, Northwest, and Canada. If a plant that grows well in Maine can also perform well in Georgia, that helps to spread the cost of development. Although the bright vegetables of farmers markets or CSA (Community Supported Agriculture) farms are the most visible elements of the locally grown menu, the demand for homegrown grains is just as intense. And just as challenging. O’Donnell was growing grain to feed his livestock at Rusted Rooster Farm when he decided to try saving his own barley seed instead of buying it each year. That worked so well that he was soon supplying seed to Fedco, another Maine seed company. He tried new grains and expanded his acreage. When a Belfast tofu maker sought local soybeans, O’Donnell was happy to plant some of that, too. And when he heard someone was looking for farmers interested in breeding a better wheat, he fired up his tractor. Like most staple crops, the wheat plant originated in a very un-Maine-like part of the world. Its colonization of the temperate world is the result of farmers carrying it around for thousands of years, gradually breeding new strains to suit each new location. But wheat struggles in New England. The weather is too wet, winters too cold, and the fusarium fungus too bold. What’s more, modern wheat varieties were bred for an agricultural system that spoon-feeds them fertilizer, and applies herbicide to kill competing weeds. Organic farming requires a wheat plant to jump out of the ground on its own power and throw big leaves over the weeds. It’s a tall order to breed such a wheat, nevermind “rogueing” each seedcrop to remove any plants that stray from the genetic game plan, and harvesting the seeds at the ideal moment: Hence a new model of plant breeding, which brings professional researchers into the field. Lisa Kissing Kucek, a PhD student at Cornell University, is heading up a “participatory breeding program” to help New England farmers like SeanO’Donnell shape the wheat seed they need. Kucek’s colleagues and farmers have spent a few years crossbreeding candidates, hand pollinating the plants and tying a bag over each precious head to prevent the wind from meddling in the process. Alice Percy, who heads the Organic Growers Supply division of Fedco, agrees. Fedco saw a doubling of grain seed sales to farmers in the past few years, coinciding with a rise in demand for food with an organic, local pedigree. Will the trend last, or will Mainers drift back to consuming beer from the Midwest and cabbages from California?